By adopting a Hybrid Cloud model, you can match the type of cloud you need to suit your unique applications and services, delivering the highest value results faster whilst minimising security risks. Moving to Hybrid Cloud in incremental stages can simply processes, aid the transition away from traditional infrastructure and provide agile, cost effective services. Ultimately Hybrid Cloud promotes flexibility, agility, increases workload capabilities and saves money. Why choose Trustmarque’s hybrid cloud services? We offer Hybrid cloud solutions between customers’ own private clouds, our multi-tenant cloud and public cloud services such as Microsoft Office 365 and Azure, so that customers can consume the best services for each area of their business. Hybrid cloud supports the need to have different cloud solutions for different business and IT requirements; but with a consistent user experience. With our hybrid cloud solution, customers can enjoy the benefits of flexibility, no capital expenditure and a high quality, reliable infrastructure across the different cloud components involved. Trustmarque have a depth of experience with public and private sector clients in delivering hybrid cloud solutions successfully. 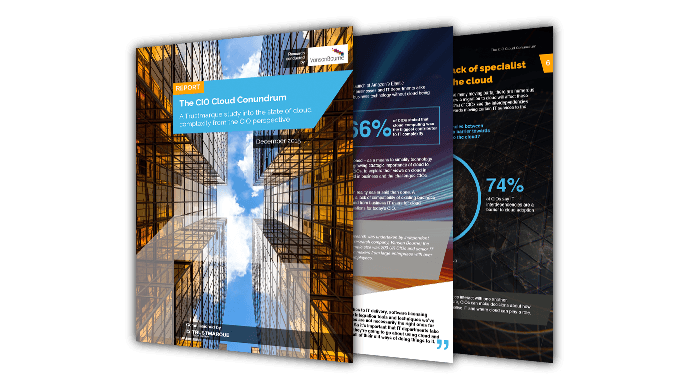 Are CIOs in the dark over cloud? Microsoft’s Azure StorSimple solution delivers on demand scalable storage and can reduce costs by up to 60% versus traditional enterprise storage. It’s true Hybrid storage capabilities provides the ideal gateway to the cloud, where you can to take advantage of economical cloud storage for your inactive data, whilst keeping your mission-critical data on-premise so you can respond to ever changing business demands quickly. Microsoft’s StorSimple solution delivers an agile storage service in the Cloud. It combines primary storage, backup, archive, and disaster recovery to optimise storage costs, data protection and service agility. In addition its unique cloud snapshot capability automatically protects and rapidly restores production data using Azure Storage. 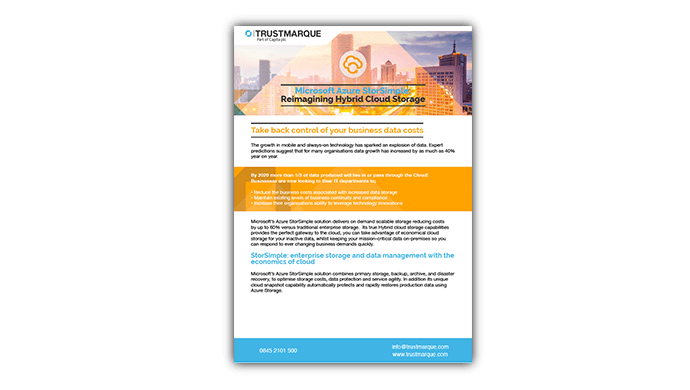 Trustmarque’s Hybrid Cloud IaaS allows you to capture the value of your workloads with a move to Azure. We deploy Windows, Linux, Microsoft SQL Sever, Oracle, SAP and Azure BizTalk Services to provide greater agility using Azure Virtual Machines (IaaS). You can deploy Virtual Machines almost instantly and pay by the minute to enable to you to manage your IT infrastructure more efficiently. Our cloud specialists will support you create a virtual data centre within Microsoft Azure, which simply appears as a new location on your network. This allows you to easily deploy new solutions or simply move your existing workloads into Azure for Proof of Concept, Development, Disaster Recovery or Production purposes.